Religion disallows and severely condemns divorce and remarriage. Over at Christian Forums a user going by the name of Dogboy122 posted a request for help. His mother had divorced an abusive and selfish husband eleven years previously and learned after the fact, only recently, that Christianity doesn’t allow divorce. He didn’t share any of the penalties she may have been threatened with as a result but you can imagine. He made it clear, almost defensively, that she had no intention of getting remarried but he was still bothered that she would be considered sinful – “tainted” – even for what most consider a justifiable divorce. 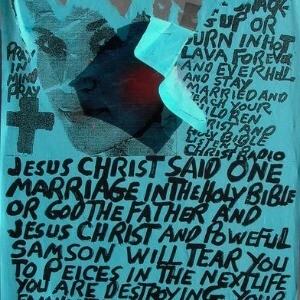 In fact, he said his interest in Christianity would suffer if there was no forgiveness for divorce. And what do you think he got in response to this heartfelt plea? He got the same adamant, traditional, not to mention inflexible, Christian responses on divorce/remarriage, all involving absolute interpretations of pointed remarks by Jesus, broadly applied with no variation allowed, to any and every marriage situation. The kind of interpretations that have been popular for centuries. There isn’t enough room here to share and answer every argument raised nor is that my intention since I’ve answered them in my book but I point this out because it demonstrates once again just how stubborn religious tradition can be. Don’t buy it! Divorce may be sad but that doesn’t make it sinful.